This is a 500 Ft. Coil of solid 1/2" (.700 OD) Poly Tube. This is the main tubing used as a supply line in most landscaping and vegetable garden applications. The 1/2" designation for this tubing may be misleading as the ID is .600" and the OD is .700". When you have it in hand it looks and is close in measurement to a 3/4" size but is referred to as 1/2" in the industry. Maximum total line length for this tubing is 400 Ft.
You can place drippers directly into this tubing. 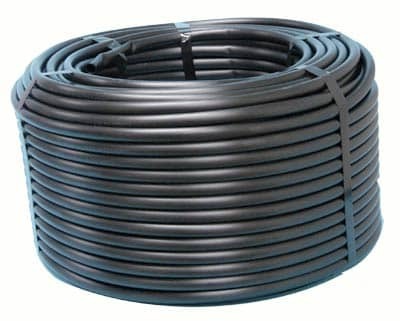 There are many different sizes of drip irrigation tubing. The Drip Store sells a wide range of sizes. In what is called the 1/2 inch size we sell the .620 OD (16 mm), .670 OD (17 mm), .700 OD and 710 OD. In the 3/4 inch size we sell the .940 OD. In the 1 inch size we sell the 1.200 OD. The 1/2" and the 3/4" serve as the main line or branch line, into which the drippers, micro sprinklers or 1/4" inch connectors with micro tubing are inserted. This 1/2" tubing is made of Dow FINGERPRINT™ DFDA-7510 NT linear low-density polyethylene resin. It is made with all virgin materials for the best quality available. Recycling is good except where drip irrigation tubing is concerned. The drip irrigation poly tubing exhibits a combination of outstanding environmental stress-cracking resistance and burst strength. The Dow FINGERPRINT™ DFDA-7510 drip tubing from DIG includes an anti-oxidant to protect the end product from thermal degradation with 5% concentrated carbon black. The materials selected contain the Dow FINGERPRINT™ (trace element) that certifies the product and provides verification as to the identity of the drip tubing in the event of failure.